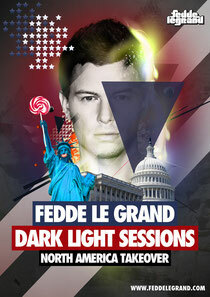 This month will see Fedde Le Grand’s Dark Light Sessions radio show go global, and to commemorate, Fedde is taking over North America with his parties! The 16-date, three-week tour is Fedde’s way of giving back to fans that have shown loyal support to the show, which goes out on Sirius XM to 18.5 million subscribers. Across three special broadcasts fans will be able to relive live recordings of Fedde’s sets, interviews with special guest DJs and producers, and for the first time ever, fan shout outs. The tour itself delivers a pertinent climax to another good year for Fedde. Check the dates below.